A neuromuscular junction exists between the axon terminal and the motor end plate of a muscle fiber where neurotransmitters are released. A neuromuscular junction is the junction between the axon terminal of a motor neuron and the plasma membrane of the motor end plate of a muscle fiber. With the arrival of an action potential to the axon terminal, voltage-dependent calcium channels open, and calcium infuses into the cell. 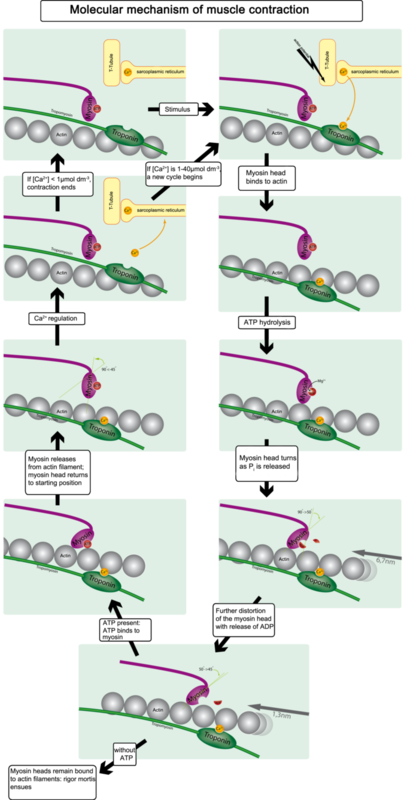 The influx of calcium ions causes the docking of acetylcholine -containing vesicles at the plasma membrane of the neuron and exocytosis into the synaptic cleft. Acetylcholine is a neurotransmitter contained in the vesicles of the pre-synaptic neuron. It is released into the synaptic cleft and activates nicotinic acetylcholine receptors on the motor end plate, and causes local motor end plate depolarization, also known as the end plate potential (EPP). The end plate potential propagates across the surface of the muscle fiber, causing the fiber to contract and continuing the process of excitation–contraction coupling. axon: A nerve fiber that is a long, slender projection of a nerve cell that conducts nerve impulses away from the body of the cell to a synapse. voltage-dependent calcium channels: A group of voltage-gated ion channels found in excitable cells (e.g., muscle, glial cells, neurons, etc. ) with a permeability to the ion Ca2+. presynaptic neuron: The neuron that releases neurotransmitters into the synaptic cleft. nicotinic acetylcholine receptor: These are cholinergic receptors that form ligand-gated ion channels in the plasma membranes of certain neurons and on the postsynaptic side of the neuromuscular junction. synaptic cleft: A small space between neurons. excitation-contraction coupling: This process is fundamental to muscle physiology, whereby the electrical stimulus is usually an action potential and the mechanical response is a contraction. A neuromuscular junction is the synapse or junction of the axon terminal of a motor neuron with the motor end plate, as shown in Figures 1 and 2. The highly excitable region of muscle fiber plasma membrane is responsible for initiation of action potentials across the muscle’s surface, ultimately causing the muscle to contract. In vertebrates, the signal passes through the neuromuscular junction via the neurotransmitter acetylcholine. Figure 1. 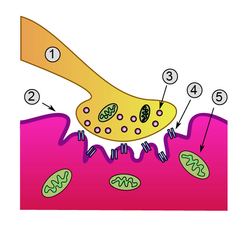 Detailed view of a neuromuscular junction: Detailed view of a neuromuscular junction: 1) Presynaptic terminal; 2) Sarcolemma; 3) Synaptic vesicle; 4) Nicotinic acetylcholine receptor; 5) Mitochondrion. Figure 2. 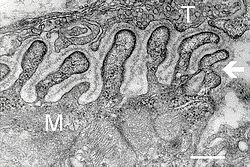 Neuromuscular junction: Electron micrograph showing a cross section through the neuromuscular junction. T is the axon terminal and M is the muscle fiber. The arrow shows junctional folds with basal lamina. Postsynaptic densities are visible on the tips between the folds. Scale is 0.3 µm. Upon the arrival of an action potential at the presynaptic neuron terminal, voltage-dependent calcium channels open and Ca2+ ions flow from the extracellular fluid into the presynaptic neuron’s cytosol. This influx of Ca2+ causes neurotransmitter-containing vesicles to dock and fuse to the presynaptic neuron’s cell membrane, which results in the emptying of the vesicle’s contents (acetylcholine) into the synaptic cleft; this process is known as exocytosis. Acetylcholine diffuses into the synaptic cleft and binds to the nicotinic acetylcholine receptors located on the motor end plate. These receptors open to allow sodium ions to flow in and potassium ions to flow out of the muscle’s cytosol, producing a local depolarization of the motor end plate, known as an end-plate potential (EPP). This depolarization spreads across the surface of the muscle fiber and continues the excitation–contraction coupling to contract the muscle. The action potential spreads through the muscle fiber’s network of T-tubules, depolarizing the inner portion of the muscle fiber. The depolarization activates L-type, voltage-dependent calcium channels (dihydropyridine receptors) in the T-tubule membrane, which are in close proximity to calcium-release channels (ryanodine receptors) in the adjacent sarcoplasmic reticulum. As intracellular calcium levels rise, the motor proteins responsible for the contractile response are able to interact, as shown in Figure 3, to form cross-bridges and undergo shortening. Myasthenia gravis is an autoimmune disorder in which circulating antibodies block the nicotinic acetylcholine receptors on the motor end plate of the neuromuscular junction. This blockage of acetylcholine receptors causes muscle weakness, often first exhibiting drooping eyelids and expanding to include overall muscle weakness and fatigue. The affects of myasthenia gravis illustrate the importance of effective and functioning neuromuscular junctions for communication between neurons and muscles to allow contraction and relaxation of muscle fibers. Figure 3. Muscle contraction and actin–myosin interactions: Skeletal muscle contracts following activation by an action potential. The binding of acetylcholine at the motor end plate leads to intracellular calcium release and interactions between myofibrils to elicit contraction. A motor unit is comprised of a single alpha-motor neuron and all the muscle fibers it innervates. Motor units contain muscle fibers of all the same type; these may be many muscle fibers (as in the case of quadriceps) or a few muscle fibers (as in the case of the muscles that control eye movement). Groups of motor units often work together to coordinate the contractions of a single muscle; all of the motor units that subserve a single muscle are considered a motor unit pool. Motor units are generally recruited in order of smallest to largest (from fewest fibers to most fibers) as contraction increases. This is known as Henneman’s Size Principle. The smaller the motor unit, the more precise the action of the muscle. Henneman’s size principle: According to this principle, motor unit recruitment is always in the same order from smallest to largest motor unit. Additionally, the motor unit action potential is an all-or-none phenomenon—once the recruitment threshold (the stimulus intensity at which a motor unit begins to fire) is reached, it fires fully. alpha motor neuron: Alpha motor neurons (α-MNs) are large, lower motor neurons of the brainstem and spinal cord. They innervate the extrafusal muscle fibers of skeletal muscle and are directly responsible for initiating their contraction. Alpha motor neurons are distinct from gamma motor neurons, which innervate the intrafusal muscle fibers of muscle spindles. motor unit: A neuron with its associated muscle fibers. Rectus femoris: The rectus femoris muscle is one of the four quadriceps muscles of the human body. These muscles may have as many as a thousand fibers in each motor unit. A motor unit consists of a single alpha motor neuron and all of the corresponding muscle fibers it innervates; all of these fibers will be of the same type (either fast twitch or slow twitch). When a motor unit is activated, all of its fibers contract. Groups of motor units often work together to coordinate the contractions of a single muscle. All of the motor units that subserve a single muscle are considered a motor unit pool. The number of muscle fibers within each unit can vary. Thigh muscles, for example, can have a thousand fibers in each unit, eye muscles might have ten. In general, the number of muscle fibers innervated by a motor unit is a function of a muscle’s need for refined motion. The smaller the motor unit, the more precise the action of the muscle. Muscles requiring more refined motion are innervated by motor units that synapse with fewer muscle fibers. Motor unit recruitment is the progressive activation of a muscle by the successive recruitment of motor units to accomplish increasing gradations of contractile strength. The activation of more motor neurons will result in more muscle fibers being activated, and therefore a stronger muscle contraction. Motor unit recruitment is a measure of how many motor neurons are activated in a particular muscle. It is therefore a measure of how many muscle fibers of that muscle are activated. The higher the recruitment, the stronger the muscle contraction will be. 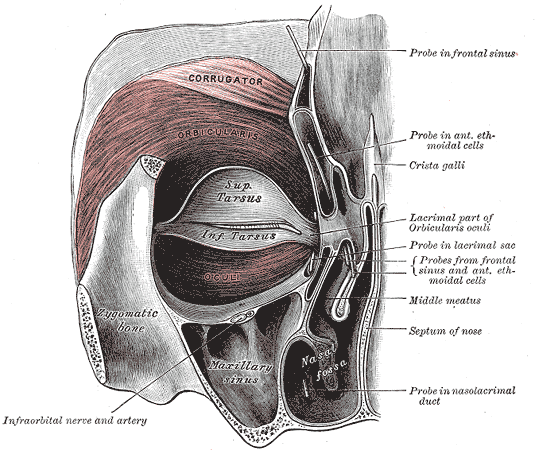 The orbicularis oris (eye) muscle: These small motor units may contain only 10 fibers per motor unit. The more precise the action of the muscle, the fewer fibers innervated. Rate of rise of force. Time to peak of a twitch contraction (response to a single nerve impulse). Sensitivity of myosin ATPase to acid and alkali. The quadriceps muscles contain many thousands of muscle fibers in general, both slow and fast twitch, to produce sufficient force for body movements such as standing, walking, running, and jumping. The eye muscles, on the other hand, contain few muscle fibers, enabling them to be more exact in movement so that vision is not jumpy, but consequently they produce very little force.